Spring is finally here, and with it that deep, human urge to dig in the dirt. 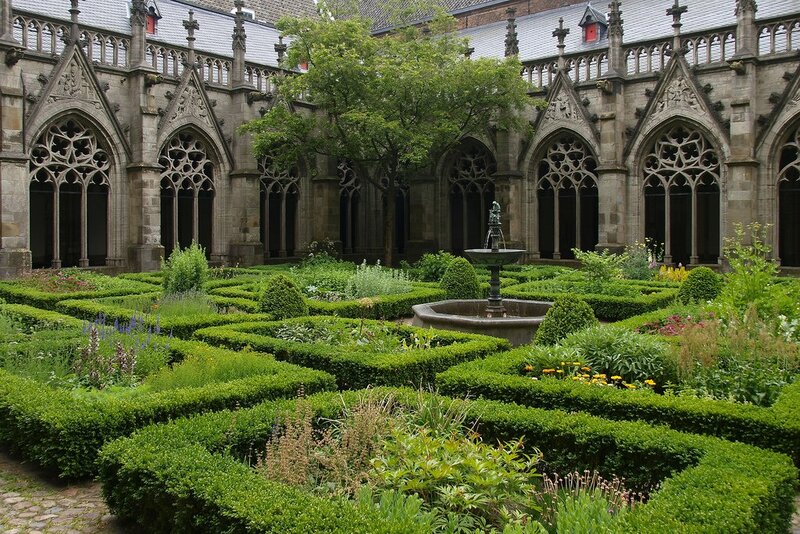 In the Middle Ages, gardening was an essential part of life, especially if you lived in a monastic community. Some monasteries, like Benedictine ones, were encouraged to be as self-sufficient as possible, which meant extensive gardens to satisfy all of the (internal and often external) community’s needs. Here are five garden elements you’d regularly find on a monastery’s grounds. There were lots of places where monks could get water for themselves and their plants, including ponds, lakes, streams, rain barrels, and wells, but fountains were something special. As Sylvia Landsberg notes in The Medieval Garden, fountains meant more than just water: “The three states of water, namely the bubbling, sparkling source or spout, the shallow, moving sheet, and the still, silent pool” represented the Holy Trinity (they were also significant to Persian thought). A fountain would have been a visible and audible symbol of the monks’ and nuns’ purpose as they traveled back and forth to services several times a day. Landsberg mentions that fountains were most often placed next to the church, making them a perfect spot to wash on the way in, or to sit in quiet contemplation of the trinity after services. Also close to the church would be a flat lawn of just grass, according to Landsberg. Not only is grass easy to grow and kind to sandaled feet, but the colour of it is also kind to the eyes. According to Hugh of Fouilloy, green “refreshes encloistered eyes and their desire to return to study returns. It is truly the nature of the color green that it nourishes the eyes and preserves their vision.” For monks and nuns who had been sitting within stone walls most of the day, depending on their tasks, a green lawn would definitely have been a welcome change for the eyes. Grass was also a cheap way to feed the horses of visiting guests in another part of the grounds, and lovely to sit on. Monastic communities needed to be able to care for themselves medically, especially if the community was large. People in the greater community also relied upon monks for medical advice and treatment – after all, the monks had all the books. If you read (or watch) any of the Brother Cadfael mysteries by Ellis Peters, you get a sense of the many needs and various plants that could be found on monastic grounds, including some all-purpose ones, like sage, and some nefarious ones, like belladonna (deadly nightshade). Excess medicines could be sold outside the monastery for the good of the lay people, and to raise necessary funds for the monastic community, as long as they didn’t charge too much. Plants would include bay, holly and ivy at Christmas, yew and catkined hazel to be carried as ‘palm’ at Easter, birch boughs in May, red roses and sweet-woodruff for chaplets and garlands at Corpus Christi in June, and white lilies and red roses for the feasts of martyrs. I think it’s easy to imagine medieval churches as dour, grey buildings, but the integration of symbolic plants into church ceremonies meant that the sanctuary was often a riot of colour and fragrance. Like the sacred plants mentioned above, there were some trees that were planted for symbolic purposes, like the mulberry, which represented the crucifixion. Most trees that were planted, though, were for practical purposes, like fruit trees and nut trees. Apples, pears, and chestnuts frequently appeared in orchards all over Europe, but monastic orchards were dual-purpose: they could also be cemeteries (another part of the domain of sacrists). This is very practical; there is no wasted space, since the trees grow upward instead of along the ground, and in the same space, plants like lilies and roses could grow over the graves as both rich religious symbols for the departed, and for use in ceremony. But the cemetery orchards were not always treated as places of respect. As Landsberg notes, the trees provided some of the few spaces on the grounds where a monk or nun intent on mischief could hide, so cemeteries were often locked up at night, in order to guard lilies of the more euphemistic variety. Even in monasteries, it’s hard to keep romance out of a garden. For more on medieval gardens of every kind, Sylvia Landsberg’s The Medieval Garden is a really worthwhile read. For more on medicinal plants, check out Toni Mount’s Dragon’s Blood and Willow Bark (also listed as Medieval Medicine: Its Mysteries and Science), and for a book in which pop culture and medieval gardens meet, have a look at Brother Cadfael’s Herb Garden: An Illustrated Companion to Medieval Plants and their Uses.